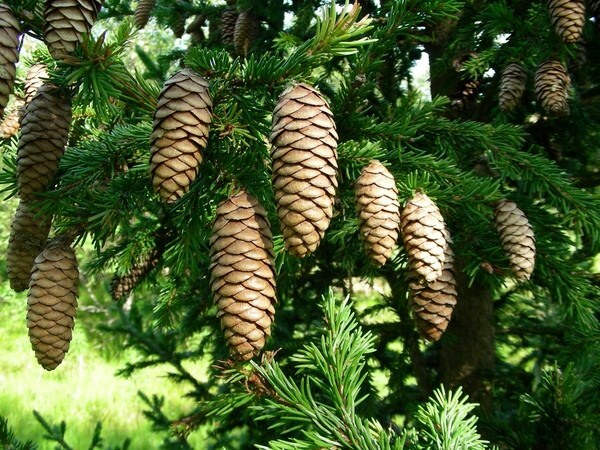 To branches of the spruce look more authentic, you can draw on them cones. But in the process of drawing is important to pay attention to seemingly minor details, otherwise, the experienced eye will detect inaccuracies. Start drawing with the image of the branches, to which is attached a lump. Keep in mind that one fir claw can grow up to twenty of these shoots. Consider also the fact that, unlike pine or cedar cones, spruce hanging straight down. Make a preliminary drawing cones in the shape of an elongated oval. Place it at the end of spruce paws in the middle of the branch buds do not grow because they are a continuation of escape. In the future you will change this oval, add detail and draw the structural features of this escape, depending on what time of year you chose. But the beginning in any case the same. Taper cone on the end which is not attached to the branch. Note that the lump needs to be symmetric relative to the Central vertical line. Erase the construction lines with the eraser tool. Draw scales on the entire surface of escape. At the base of the cones they are larger and more muscular, have cracks, jagged edges. At the end of the scales are more young and smooth. If you want to portray the summer, draw a cone with closely adjacent to each other scales. Closer to the fall they begin to lag behind from each other and puff up a bump like it looks loose. In addition, in wet weather the scales are compressed, and in the dry disclosed. So if you draw a rainy day, draw the cone tight. Note the order of growth of the scales on the cone. They are not located in neat rows, like corn on the cob, and as the bricks in the masonry. The middle of the bottom of the scales is located between two of the top row. Paint the drawing. Mature cones fall use brown and beige colors, for young add a green tint. Don't forget the shade under protruding scales. Select a dark paint damage and irregularities on their surface.